Two sisters fight with manners, magic, and mayhem to reclaim their family’s name, in this captivating historical fantasy adventure. 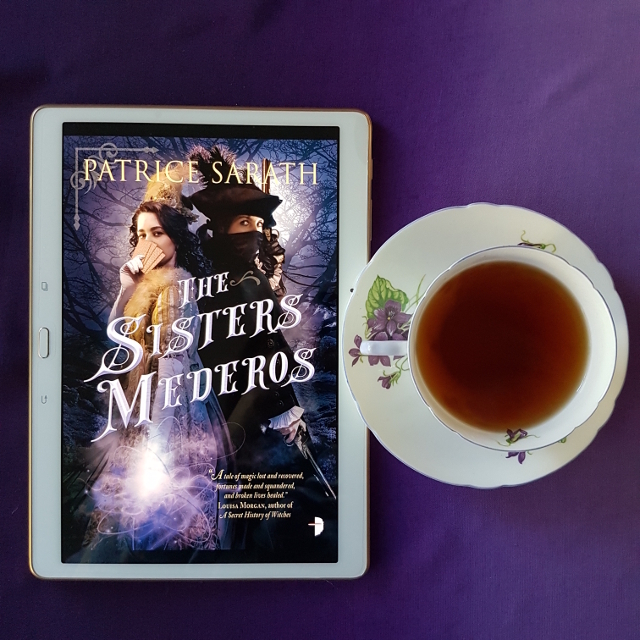 There are a lot of exciting elements in The Sisters Mederos: a game of cat-and-mouse with a shadowy enemy, wild parties, double lives and a good old-fashioned dose of revenge. Unfortunately, these elements don’t manage to blend into a solid story. The story opens with the girls being packed off to boarding school as the Merchants’ Guild break into the family’s home to charge them with trumped up crimes. We then flash forward to the girls’ return home. Thanks to persecution from the Guild, they now live in greatly reduced circumstances and are struggling to put food on the table. While their parents and uncle struggle to cope, the girls each privately vow to discover the truth of who’s responsible for their situation and make them pay. They go about this in very different ways. Yvienne, the oldest, takes to writing anonymous and inflammatory opinion pieces for one of the local newspapers while using her position as a governess to investigate the paper trail surrounding her House’s downfall. She also discovers she makes quite a successful robber and starts holding up the city’s nobility under the cover of night. Being the quiet, responsible one of the sisters, her family never suspects her and even her sister is surprised by the icy depths of her resolve. She is a person who gets things done and I enjoyed that about her. In contrast, Tesara has a reputation as the naughty and mischievous sister. Strange things have a way of happening around her–sudden squalls of wind when she’s upset, the tablecloth ripping itself off the table. However, her family refuses to acknowledge any possibility of magic but instead blames Tesara for what is not entirely in her control. Resentful, Tesara sneaks out one night to a party with an old friend… and rediscovers her talent for counting cards. She puts these skills and her flighty reputation to good use by fleecing the nobility of their wealth. It was immensely satisfying to watch her turn the stereotype to her advantage. Although the sisters are compelling characters, they are let down by their family. Their mother is a bitter woman, turning her sharp tongue on the rest of the family at the slightest provocation. Their father has become a vague and anxious man, aged too quickly by the family’s travails. And their Uncle is an unpleasant sort of man, desperate to be part of the old boys club again and prone to sexually harassing the help. Such an unlikable cast of characters makes it difficult to root for the family’s restoration. However, I also recognise it’s a difficult line to walk because without their self-absorption it would be hard to justify their obliviousness to the activities of the sisters. The unlikeability of the family undermines any chance of making “family before all else” a convincing theme. It also never quite manages to create a sense of the sisters binding together against the world. They’re too busy keeping secrets from each other; even at the very end they’re still not wholly transparent with each other. So, despite their obvious affection for each other, there’s still a sense that their alliance is only temporary. This wasn’t the only part of the plot and world-building that felt weak. The villain’s motivation in targeting House Mederos was insufficiently convincing and they didn’t have much of a presence throughout most of the story. Tesara’s magic also never had much of an impact on the plot and I was never quite clear on if there was supposed to be some mystery over whether she actually possessed any power. The ending wrapped up quite quickly, dropping elements left and right. Being the first book in a series, it’s possible that some of these elements will receive some more attention in subsequent books. But by and large, it felt like the Mederos tale had been intended to stand on its own and had reached its natural conclusion. I would therefore be surprised to see future books focus on the family. I’m hesitant to describe the story as a historical fantasy. Not only does it appear to be set in a secondary world, the time period it’s based on seemed to shift around. The majority of the story has a Regency influence, shown in the fashion and social conventions. However, the parties Tesara attends had more of a 1920s vibe in terms of the extravagance and fashion. While I quite enjoyed this blending of periods, it’s not going to be to everyone’s taste. All in all, The Sisters Mederos was a book that promised a lot but ultimately failed to satisfy. Pity — I love the premise, especially since it includes them going to boarding school. I love sisters and boarding schools, this is hugely disappointing. The thing is it doesn’t actually include them going to boarding school. There’s a snippet in the prologue where they arrive at the boarding school and there’s an incident. Then when the first chapter starts they’ve been home again for two weeks. So, I don’t think you would have found it satisfying on the count either.